Peanut butter cookies is one of the two things I remember we baked at home, while growing up. We were not a baking family. We were more grilling and stove top people. The other thing we baked at home were pound cakes. Yes! And I remember we used Blue Bonnet butter. US imports into the PI back then which were aplenty. And pound cakes and peanut butter cookies were a staple in our kitchen. The most fun out of making the peanut butter cookies were the criss cross patterns which me and my siblings would fight over who should do it. These days, with peanut butter overtaken by Nutella in recent years, the girls were not a bit interested with these. So I had these to myself and my siblings when they came over. I'd like to say these are healthy because butter is substituted with coconut oil, and we also made our own peanut butter. So pretty much, we knew what went into these cookies. The cookies came out soft and chewy (as we wanted), but you can always make it crunchy. If you want to make this with your own peanut butter, The Kitchn has the step by step-step easy procedure to make them. Of you can simly use store-bought peanut butter. First you will need peanuts. For our version of this peanut butter, I used salted peanuts because I didn't want to add any more salt while making them. I also roasted them in the oven first then cooled before making the nut butter. Then they go into your food processor. The first pulse gives you a grainy texture of milled or pounded nuts. The next process gives you a smoother nut butter and almost ready to use. I just added 2 tablespoons of vegetable oil and it was ready! Poured into a jar and kept at room temperature. It lasted for more than two weeks. But of course, we ate them with warm Filipino pandesal bought from our local Asian grocer immediately. Taste test for quality, as you do. 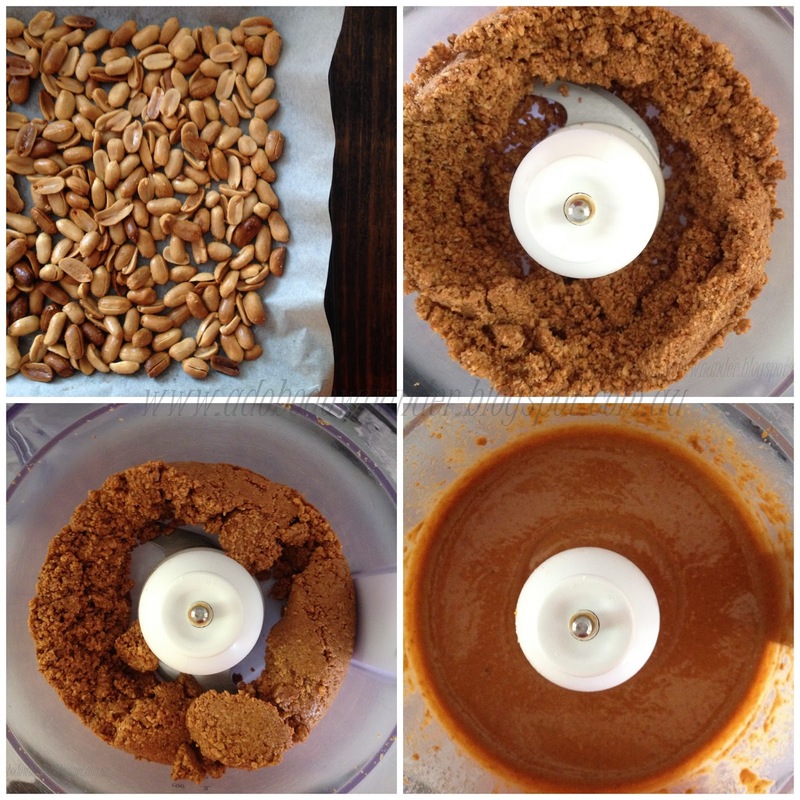 To make the peanut butter, I adapted the recipe from Elise at Simply Recipes. In a medium sized bowl, combine the dry ingredients and mix with a whisk. In the bowl of your stand mixer, beat the coconut oil and sugar until creamy, 2 or more minutes. Add the peanut butter and eggs and continue beating until light and fluffy. Add the dry ingredients in 3 batches, continuing to mix with every addition, and until the dough comes off the sides of the bowl. Wrap the dough in cling film and refrigerate for 3 hours. Preheat oven to 175*C. Prepare a cookie sheet with baking paper or silicone mat. Shape the dough into rounds, golf ball size. Place on the prepared pan/cookie sheet 2-3 inches apart. Flatten the cookies using a fork with a criss cross pattern. Bake in the oven for 15 minutes for chewy cookies, or until golden. For crispy cookies, bake in a preheated 180*C oven for 10-12 minutes. These cookies are not sweet, as I lessened the sugar a little bit, and they were surprisingly good. There were no coconut flavour or odour which some people dislike when using coconut oil. * To use coconut oil, it helps when the oil is a little bit solid. Usually, coconut oil solidifies when the weather is cooler. If you use liquid coconut oil, it will take longer to beat it until light and fluffy. To solidify your coconut oil, measure what you need and place it in the fridge overnight, and just take it out an hour or more before using. * The cookies lasts longer than when butter is used. I tested a few of these, and they kept for two weeks in an air tight container room temperature.